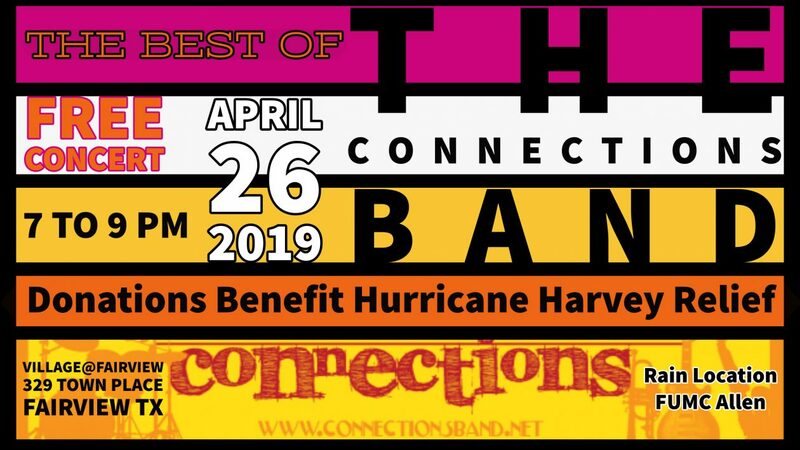 Invite your friends and neighbors, coworkers and family to the newest Connections Show: Greatest Hits 2019, on Friday, April 26, at the Fairview Town Center 329 Town Place, Fairview, TX 75069. The show features songs gleaned from the 13 years the band has played together. The selections include audience favorites, which are also our favorites, and they are ones the band does very well! The concert starts at 7:00 pm and will wrap up around 9:00pm. While the event is free, we’ll collect an offering to benefit Hurricane Harvey Relief. In case of inclement weather, we’ll move the concert to FUMC Allen 601 S Greenville Ave Allen 75002. Watch this page and FUMC Allen’s social media for updates.